On Monday, April 15th, the Sanhedrin will be overseeing a spectacular full-dress reenactment of the Passover offering, the most important sacrifice an individual brings to the Temple. The ceremony will be held at the Davidson Center adjacent to the Temple Mount. When the Temple stood, all of the Jewish people came to Jerusalem and organized into groups to celebrate the Passover seder. Each group sent a representative to the Temple to bring a lamb which would be ritually prepared by the priests and its blood sprinkled on the altar. The lamb would then be taken home to be cooked and eaten. The ritual was so important that any Jew who did not perform it was sentenced to karet (being cut off from the Jewish people). 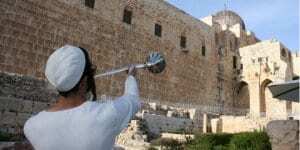 The reenactment will be performed by Kohanim (Jewish men descended from Aaron the priest) wearing the Biblically mandated garb and using utensils that were prepared for use in the Third Temple. Silver trumpets will be played as they were in the Temple. The organizers have arranged the proper permits to allow for a lamb to be slaughtered and cooked on site. The meat will be distributed to the public. This will be the eighth annual Passover sacrifice reenactment with the attendance growing each year. Last year, more than 1,500 people attended. The Sanhedrin recently performed an intense study concerning the current status of the Passover offering and concluded that at this juncture, one sacrifice made at the Temple Mount brought in the name of the entire Jewish people would suffice. There are a few Israeli politicians who advocate Jewish rights on the Temple Mount and Rabbi Yehudah Glick of Likud is undoubtedly one of the most powerful voices calling for religious equality at the site. 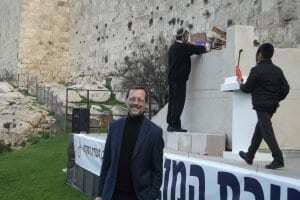 But Weiss pointed out that there is only one Israeli politician who has attended every Temple reenactment: Moshe Feiglin, head of the Zehut party. 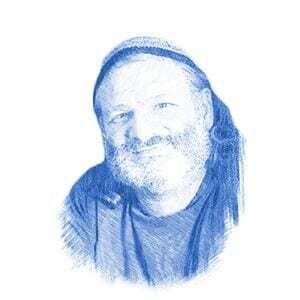 Weiss emphasized that the Sanhedrin is not specifically endorsing Feiglin’s candidacy. The Temple Mount became the focus of international concern one month ago when Palestinians rioted on the Temple Mount, breaking into an area adjacent to Sha’ar HaRachamim (Gate of Mercy, also known as the Golden Gate). They spontaneously declared it to be a mosque, the fourth established on the Temple Mount since Israel conquered the site. Israeli and international law require equality of religions at holy sites which should allow for Jewish prayer on the Temple Mount but the Israeli police cite security concerns to prohibit this. Sales from commemorative coins issued by the Sanhedrin provide the funds for the Temple reenactments. The Sanhedrin recently issued a coin featuring the image of Nikki Haley, the former U.S. Ambassador to the UN in recognition of her efforts to combat anti-Israel bias. The Sanhedrin invited Ms. Haley to serve as the honorary president of a Biblically mandated organization of 70 Nations. The coin can be purchased on the Mikdash Tzion website.